Point Pleasant sophomore Juan Marquez locks in a hold during a 220-pound match against Huntington on Wednesday night in Point Pleasant, W.Va.
Point Pleasant freshman Isaac Short locks in a hold during a 113-pound match against Huntington on Wednesday night in Point Pleasant, W.Va.
POINT PLEASANT, W.Va. — Some ups and downs, but the Highlanders ultimately came out on top. 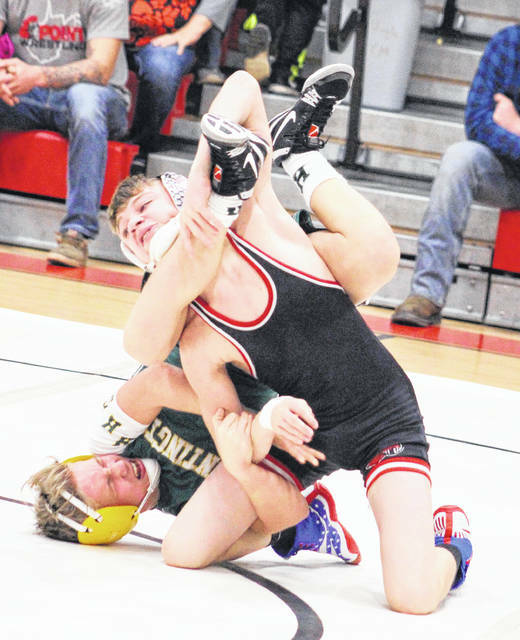 Visiting Huntington won eight of the 14 individual matches on Wednesday night en route to a 43-27 victory over the Point Pleasant wrestling team in a dual contest at The Dungeon in Mason County. The host Big Blacks started the evening well with wins in the opening three bouts, but the Highlanders countered with victories in all but three of the final 11 matches to rally back from an early 12-point deficit. HHS — a perennial power at the Class AAA level — recorded five of the seven pinfall victories in the dual and also benefited from the lone forfeit of the night, which occurred in the 145-pound weight class. The contest started in the 106-pound division, with Justin Cornell leading wire-to-wire while securing 6-2 decision over Arthur. Isaac Short followed with a 7-2 decision over Doss at 113, then Mitchell Freeman scored a second period pinfall over Serrano in the 120 division — giving PPHS a 12-0 advantage. Huntington, however, responded with back-to-back pinfall wins to knot the match up at 12-all. Adkins netted a second period win over Caleb Lane at 126 pounds, then Dempsey scored a second period pin over Riley Oliver at 132 pounds. Wyatt Wilson gave the Big Blacks their second lead of the night after earning a second period pinfall over Sollards at 138 pounds, but Point’s forfeit to Hagley at 145 once again tied things at 18-all. PPHS secured its final lead of the night in the 152-pound match as Jacob Roub held on for a slim 1-0 decision over Dempsey, giving the hosts a 21-18 edge. Huntington went on to win the next four matches, two of which were by pinfall, as the Green and Gold opened up a 37-21 lead with only two divisions left. Stewart defeated Logan Southall with a first period pinfall at 160 pounds and Pardee earned a first period pinfall win over Colton Carr at 182 pounds. Pardee claimed a 6-3 decision over Jacob Bryant at 170 pounds, while Ball posted a 9-0 major decision over Clayton Hill at 195 pounds. Juan Marquez scored Point’s final victory of the night with a first period pinfall over Cremeans in the 220 weight class, closing the deficit down to 37-27. 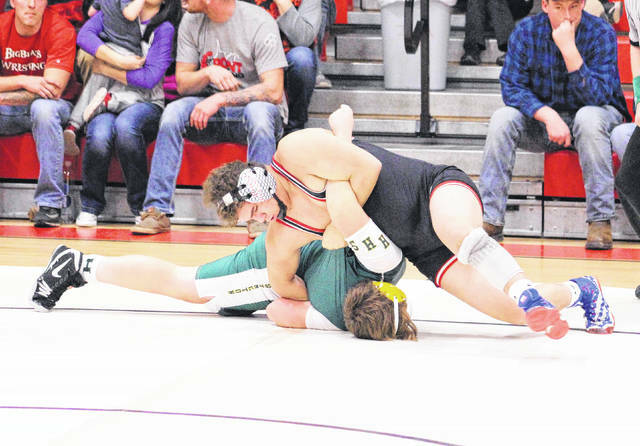 Huntington got a first period pinfall win in the heavyweight division as Kelley defeated Jacob Muncy in the finale, wrapping up the 16-point outcome. Point Pleasant had underclassmen in nine of its 13 individual events, including four sophomores and four freshmen. The lower two grades finished the night 5-3, while the top two classes went 1-4 overall. The Big Blacks were also without 2015 state champion and last year’s 113-pound Class AA runner-up George Smith due to an injury. Overall, PPHS coach John Bonecutter thought the night was a mixed bag of results — but he was mostly happy with the way his young squad battled against the Highlanders. “I felt like we wrestled well at times tonight, but you never really know what to expect when you have a young team,” Bonecutter said. “We had some growing pains and there were some things that I wasn’t really happy about tonight, but we also some really bright spots from the younger kids. The kids stepped up and wrestled hard against a quality program, although it would have been nice to win the dual. 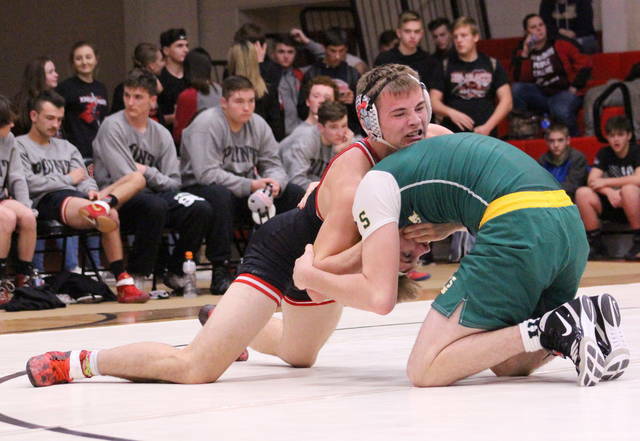 Point Pleasant returns to action Friday and Saturday when it hosts the 12th annual Jason Eades Memorial Duals. The opening round of matches start Friday at 5 p.m., then competition resumes Saturday at 10 a.m.